Throughout history, obtaining food has been a struggle. Today, however, getting food is merely a matter of satisfying our personal whims and fancies. Our choices are no longer limited by local seasons or climate. In fact, individual foods are usually in season somewhere and may be shipped halfway around the world just for our convenience. Our food supply has never been more abundant, and feeding ourselves has never been easier. Technological advancements in farming, transportation, storage, and processing of foods have made this bounty possible. Whereas in the past people bought fresh produce, dairy products, and meats directly from the farm, today people rarely have time to plan well-balanced meals and track down local foods to use in their preparation. For convenience, we tend to buy our food in grocery stores or restaurants. And, unlike our ancestors, we eat convenience foods of all types - even entire meals - which are readily available in packages, cans, jars, “boil-in-bag” pouches, freezer trays, and microwave-ready containers. Chemical changes. Oxidation and fermentation may cause foods to deteriorate. For instance, oxidation can destroy vitamins A and C.
Heat. Meat, fish, poultry, some fruits and vegetables, raw milk, and many other products can become inedible in less than a day at room temperature. Cold. “Chill injury” and “freezer burn” can lead to nutrient destruction. So, too, can repeated freezing and thawing. Light. Light can spur the destruction of nutrients, especially riboflavin, vitamin A, and vitamin C, and can induce the oxidation of fats. Irradiation. This technique kills microorganisms but can inactivate enzymes which occur naturally in foods. Moisture. Damp storage conditions can hasten the destruction of nutrients. Natural food enzymes. The same enzymatic reaction that causes fruits and vegetables to ripen will continue to the point that produce rots. Microorganisms. Bacteria, yeast, and molds lessen the nutritional value of foods. Macroorganisms. Insects, parasites, and rodents can destroy foods. Physical stress. Food preparation may include peeling, cutting, dicing, and shredding - all of which can reduce nutrient content. Time. Fresh corn and peas, for example, lose nutritional value within hours of harvest. And if you let a fresh vegetable sit in the crisper for a week, you would be better off with a frozen or even canned vegetable for dinner! The nutrient content of soil can vary greatly from one farm to the next. Essential nutrients, especially minerals, can become depleted after years of farming the same soil. Although fertilizers may offset these differences, the nutrient values of certain foods may not be consistent purchase after purchase. Modern farming technologies also impact nutritional value. For example, genetic engineering led to the development of special varieties of tomatoes that have a uniform size convenient for canners, and a thicker skin necessary for machine harvesting. But engineered tomatoes have less vitamin C and lycopene (an important phytonutrient) than their natural cousins. Farming practices can also have a negative impact. Farmers frequently harvest produce before it’s ripe, robbing plants of the chance to attain the nutrient density and diversity that develop with maturity. Moreover, air and water pollutants, such as smog, insecticides and herbicides, can also act as chemical antagonists and rob fruits and vegetables of some of their nutritional value. After harvest, food may be stored on the farm in barns or silos before it’s sold to food brokers and transported to warehouses. It may sit for months before it is transported to grocery stores to be stocked, displayed, and sold. During transportation and storage, factors such as temperature, light, moisture, and even time itself act to lessen the nutritional value of foods. Food processing - a wide array of techniques that modify foods for storage, convenience, taste, etc. - can further drain the nutrient value from food. Produce, for instance, is often peeled, cored, cut, shredded, or chopped before it is frozen, canned, or cooked. Such processing strips away nutrient density and diversity. In the interest of convenience and storage, much of today’s produce is available frozen. The produce is shipped from a broker’s warehouse to a processing plant where it can be held for several days prior to freezing. In the meantime, the foods may be sprayed with chemicals to delay spoilage and repel insects. Many types of produce are blanched (boiled for several minutes and cooled rapidly) before freezing. This process can destroy much of the vitamin C, thiamine, and enzymes. While freezing will help preserve the remaining nutrients, the food’s nutritional value will continue to fade with time. Canning, too, can degrade the nutritional value of food. Canned food often undergoes harvesting, receiving, soaking and washing, sorting and grading, blanching, peeling and coring, can filling, air removal, can sealing, cooling, labeling, packing, and storage. A form of baking soda may be added to very acidic foods with the result that B-vitamins are destroyed. Food may also be treated with additives to preserve colour and texture. The high heat necessary for canning can lead to major losses of minerals, and canning fluids provide a reservoir into which vitamins can leach. We accept without question the fact that the health of crops and livestock depends upon the nutrients they are provided. Yet many people attempt to build healthy bodies by consuming highly-processed, refined foods with inadequate amounts of crucial nutrients. Ironically, the nutrients removed in refining processes from these products are often fed to livestock to improve their health! Grains: Refining strips grains of much of their nutritional value. For instance, most of the nutrients in rice are concentrated in the husk, which is removed during processing to make white rice. Likewise, commercially prepared cornmeal is often “degermed” prior to packaging to extend its shelf life. The corn germ is then used to manufacture corn oil, while we consume the remaining cornmeal. Similarly, when wheat is refined, the germ and hull are removed, eliminating most of the fibre, B-vitamins, vitamin E, lipids, and sterols. When the wheat is baked into bread, 15–30% of the thiamine may be lost. Sugar: In its raw state, sugar is a nutritious food containing a great number of vitamins and minerals. During refining, these nutrients are removed as raw molasses, which ranchers add to animal feed - along with the wheat bran and wheat germ removed from refined grain - in order to raise healthy livestock. Once more, we consume the dead, empty calories that remain. Refined sugar is 100% carbohydrate and has no value to the body except as calories. 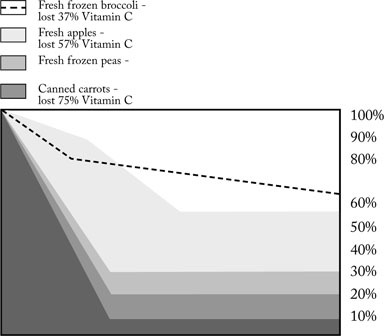 Fruits and Vegetables: Food processing may remove healthful phytonutrients (plant nutrients), as they tend to make fruit juices bitter and can contribute to rancidity. Similarly, carotenoids - plant pigments which research has shown support immunity and cardiovascular health - are often removed from plant oils to “de-colourize” them. And processes such as canning can destroy lutein, a phytonutrient in spinach and other green, leafy vegetables that is important to eye health. Cooking is often the last step in the preparation of food before it reaches our table. Heat, oxidation, or other chemical reactions during this process can destroy vitamins (especially B and C), amino acids, and enzymes. Also, boiling or blanching foods can cause vitamins and minerals to leach out of foods and into the cooking water. Even steaming fruits and vegetables - second in nutritional value only to consuming them raw - can cause nutrient loss. The bottom line is that your food may not be as nutritious as you think. Every day nutrients are processed out of our food in the name of convenience. Even if you pick the right foods - and most of us don’t - you may not be getting the nutrient density and nutrient diversity you need for optimal health and vitality. While one solution would be to eat only fresh, raw, or slightly cooked foods in as close to their natural form as possible, few of us can spend our entire day hunting, gathering, and carefully preparing our food. We must look for practical alternatives. The key to an optimal diet is good whole foods and good whole-food supplements. GNLD offers an excellent solution to this dilemma: our complete line of fine nutritional supplements. Each product is formulated to support genuine human health needs and to assure a complete, balanced daily intake of important nutrients. For hundreds of thousands of people around the world, GNLD products are an important part of their daily diet and health care regimen. Take charge of your health by joining them! The nutritional value of your diet could have an important impact on your vitality today and your health tomorrow.